I put up a post a while ago comparing U.S. movie posters for American movies to the versions that were released for the same pictures in Italy. As I continue to roam the web, and particularly the newly discovered MoviePostersDB.com, I continue to find that foreign, particularly Italian, posters are far more artistic/intriguing/seductive than the American ones. This time I have focused specifically on Hitchcock movies, films that in and of themselves embody artistry, intrigue and seduction. These movies, because they were so well publicized, have multiple posters per country to their name, but here I have grabbed what appear to be the most common versions. 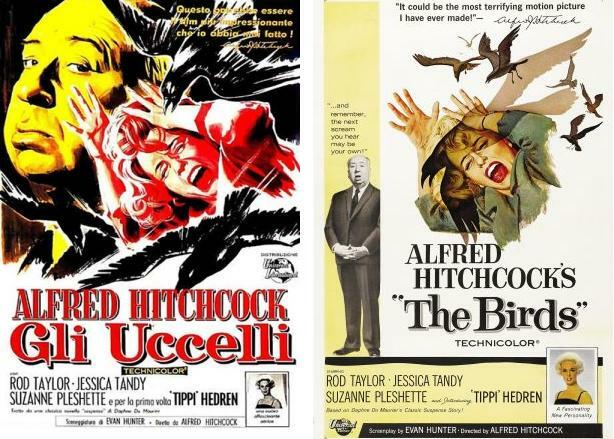 I think there is no arguing that the American version of what would advertise Hitchcock’s first American film looks pretty bland compared the foreign one. I also concede, however, that the former looks a bit like a romance novel cover. And who is the gorgeous woman in the backdrop? Certainly not Judith Anderson’s Mrs. Danvers. It could be the artist’s manifestation of the deceased Rebecca, but she is never shown in the picture, which is sort of the point. 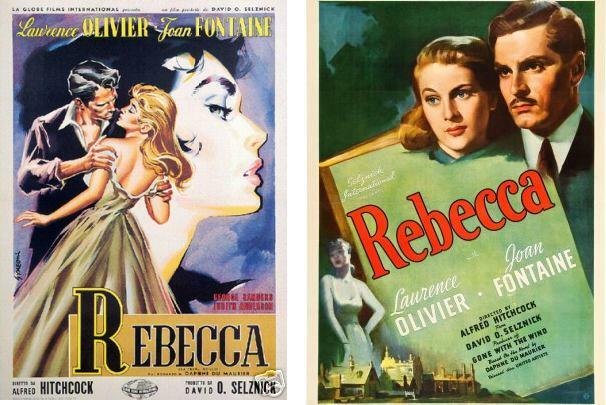 Nevertheless, I would rather see the Rebecca advertised by the image on the left than the one on the right. 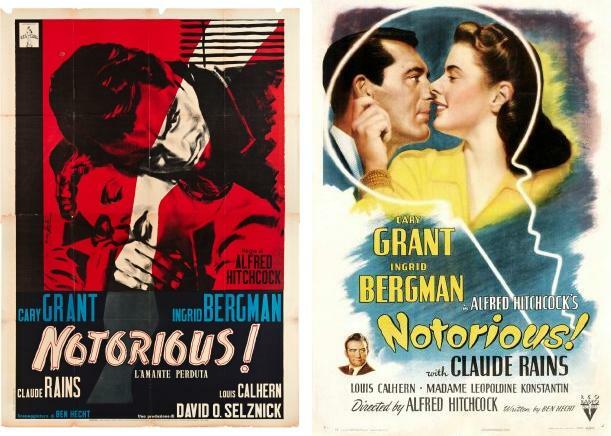 Notorious is possibly my favorite Hitchcock movie and one that is certainly darker than the American poster would suggest. Although the key depicted is of significance, the romance between Cary Grant and Ingrid Bergman is not as light-hearted as the advertisement would suggest. The Italian poster is a bit vague in its meaning and with the title perhaps suggests merely a story of an illicit affair, but it is by far the edgier version and one that better suits the tone of the actual movie. Although I have always enjoyed the Dial M for Murder American poster, the Italian version is a bit more striking, and bloody. Because the Italian title translates as “Perfect Crime”, choosing to focus on the weapon rather than the phone that justifies the American title makes sense. It also notes other intricacies of the film, such as the scissors and the time. I can see the favorite of these two being a toss up for some people. Your thoughts? I am not in love with either of these posters, but the foreign version is much more eye-catching. It highlights the one setting in which the entire film takes place while highlighting its star, who is perhaps not as mean as the poster suggests. The U.S. ad is just bland. We get it: it’s called Rope and there’s a rope. In this instance, the Italian poster borrows from the American one but manages to give us a much different feel for the movie. The use of unnatural color and the red tone suggestive of blood makes The Birds a more frightening looking picture. The birds themselves also look more threatening in the overseas ad, which allows it to trump the domestic version. I’m not sure I can entirely pass judgement and declare the Italian Vertigo poster better than the U.S. version. 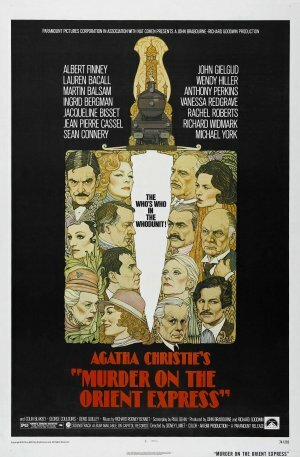 Although the foreign advertisement has many seductive and creepy elements, the simplicity of the American poster and its emphasis on the vertigo effect invented by Hitchcock in making that movie is difficult to rival. Again, the Italian movie title is not the same as the American, so “The Woman Who Lived Twice” likely inspired a different poster. I recently commented to a friend after seeing This Means War in the theater that it is interesting/good to see movies that portray single men and women who are beyond their 20s finding love and marriage, in some cases for the first time. In fact, with stars like Reece Witherspoon (36) and Jennifer Aniston (43) who perhaps have gotten better looking with age, many romantic movies today appeal to a demographic beyond its college years. But watching one of my favorite movies this week, Indiscreet, I realized that motion pictures have never shied away from mature romance. As in contemporary conveyances of adult romance, the lead characters have typically eschewed love and marriage in favor of a career or have “been there, done that” and are now divorced. Thus is the case with Ingrid Bergman (43) and Cary Grant (54) in Indiscreet, sort of. Berman is famous British stage actress Anna while Grant is a financial expert Philip whom NATO seeks for employment. The two meet through mutual friends –Alfred (Cecil Parker) and Margaret Munson (Phyllis Calvert), the latter being Anna’s sister– and Anna is struck with love at first sight and reacts as a grown-up school girl. Philip is interested as well, but when Anna later asks him to the ballet, he reveals he is married and separated “and cannot possibly get a divorce”. The two nevertheless maintain an affair aided by the man’s acceptance of the NATO job in France. He commutes every week to London and has taken a flat below Anna’s so he may sneak up to her place without alerting the building staff and damaging the actress’ reputation. When Philip is assigned to work in New York for five months, Anna impulsively asks the man to marry her, but immediately rescinds the plea. She soon finds out that Philip’s marital status is not as she expected and plans a ruse to teach him a lesson. Extramarital affairs were not terribly kosher in 1950s cinema and the Hayes Office never cared for any display of premarital relations, but Director Stanley Donen is, well, discreet in how he conveys the relationship. The couple are never depicted doing anything more than kissing, made more suggestive with the camera tracking backward from Anna’s front door. The characters, however, always seem to wake up in their own beds. Although, in another subliminal move, Donen split-screens the protagonists speaking on the phone to one another while laying in bed. The shot is done in such a way as to make it look like they are laying side by side. The story was adapted from the play “Kind Sir” that had proven a Broadway flop. The central premise was one that had potential, however, and so the rights were acquired cheaply and delivered to Donen. The director had been working with Grant on Kiss Them For Me, and was looking for another film on which to collaborate. Grant was amenable to the adaptation but insisted Bergman be his leading lady. She did not need much convincing. Donen had some concerns because this comedy was not something Bergman had engaged in much during her career, yet she pulls it off swimmingly. Grant has remarked it is one of his favorite pictures he made. Indiscreet is a fun and touching movie. Although we have fun watching the romance blossom between the two characters, we also feel for Anna as she becomes frustrated with her other-woman status. Both Grant and Bergman bring something special to the roles and the seasoned actors are so comfortable together. The two had also played romantic parts in Notorious 12 years earlier, but their maturity was evident in the later flick. Gaslight is one of my favorite movies of all time. I discovered it early in my classic movie foray because I was really into Joseph Cotton. The story is a wonderful mystery full of suspense and intrigue and really has all the markings of a Hitchcock film without actually being one. The director is instead George Cukor, who has more than enough experience to make such a masterpiece. The story is about Ingrid Berman‘s Paula and her husband Gregory, played by Charles Boyer, and the woman slow decent into madness. Paula’s aunt/guardian was a famous opera singer who was murdered by a thief hoping to seize some valuable jewels. Ten years later Paula returns to her aunt’s house with a new husband but starts having flashbacks to the terrifying past. Gregory presents himself as a creepy character from the start, always patronizing his wife into a submissive role. He pats her and tells her she confused when her items start disappearing. Paula has also been noticing a strange change in the gaslights in their London flat. The flames seem to go down as though someone has turned up the gas in another part of the home, except no one has. This does not help the woman’s mental state any, but she has one ally on her side: Joseph Cotton as a fan of Paula’s aunt who mistakes the young woman for her relative. He starts to gather that something sinister is afoot in Paula’s home and pokes his nose in enough to save the woman. The story for Gaslight is really fascinating and creative and the actual gaslights in the home make for such a cool device alluding to the answer to all of our questions. Bergman gave an Academy Award-winning performance as Paula as no one can deny how deftly she conveys a weakening of the mind. Besides Bergman, also nominated for Oscars were Boyer and Angela Lansbury, who makes her screen debut as the cockney, sassy maid. The picture was also nominated for cinematography, writing, art direction and Best Picture. I think I could watch Gaslight every day and never be tired of it. Ryan and I love to imitate Boyer’s chiding utterance of “Paauullaa” in that French accent of his as it is both absurd and creepy. This movie sort of ruined Boyer for me as anything but a sinister actor, however. Watching him in Love Affair was a challenge. "I told you, there's nothing wrong with the lighting, Paula!" Although made in 1982, Dead Men Don’t Wear Plaid could be claimed as 50% classic film. The Steve Martin spoof on old detective dramas uses footage from about a dozen black-and-white movies spliced in with new footage. I first saw this movie in an Intro to Film course and fell in love. It’s full of Martin’s early stupid humor while also showing a real appreciation for old Hollywood. Martin is Detective Rigby Reardon, who is approached by Rachel Ward‘s Juliet Forrest to investigate the murder of her father, a scientist and cheese enthusiast. The plot that follows is inconsequential as it is as complex as The Big Sleep –clips of which are used throughout– and is neatly summed up by both the villain and Reardon at the end of the picture, ala The Thin Man and other mysteries. Rigby’s mentor is Marlowe, with whom the protagonist consults primarily via telephone, and who is played by Humphrey Bogart in segments from three of his films. The detective also pays visits to several familiar faces, such as Ray Milland in a snippet from The Lost Weekend, Bette Davis in Deception, Cary Grant in Suspicion, Ingrid Bergman in Notorious and Joan Crawford in Humoresque, among others. Martin also dresses in drag to attract the attention of Fred MacMurray in Double Indemnity. The unsettling part is, from behind, there is little difference between Martin and Barbara Stanwyck from the original clips. Martin again dons a dress to masquerade as James Cagney’s mother from White Heat. Writers on the movie George Gipe, Director Carl Reiner and Martin developed the story based on the classic clips. The idea came from one designed by Martin that proposed the use of a classic movie clip. That concept transformed into doing an entire movie using such pieces. After watching old films and pulling particular over-the-shoulder shots and appealing dialogue, the writers then merely juxtaposed the dialogue until they came up with a suitable story. Some clips were clearly used just as an excuse to insert them and do not actually further the plot, but are funny nonetheless. Although the cinematographer consulted the filming styles from the old flicks, Martin avoided them altogether. He said he did not want to give a performance reflective of Bogart but something of his own. The result was great as I do not think Martin would have been as funny if he had taken himself more seriously. As someone who enjoys both Steve Martin humor and classic films, Dead Men Don’t Wear Plaid is just the epitome of fun for me. I was not familiar with all of the movies featured therein, but I certainly enjoyed figuring out the ones I did know. Thankfully the end credits spell it out for the viewer. Notorious was my favorite Hitchcock film for a long time (before I saw Rebecca). I was grabbed by the actors and the terrific story, so well executed. It offers spies, foreign locales, romance, sexual implications, and a woman whose life is endangered, all common Hitchcock elements. Ingrid Bergman plays Alicia Huberman, daughter of a Nazi traitor recently convicted. Cary Grant as a U.S. agent of some sort, T.R. Devlin, recruits the woman to infiltrate a Nazi operation in South America, to allow the gal to serve her country and make up for her father’s sins. Devlin uses Alicia’s connections through her father to reunite her with Claude Rains’ Alexander Sebastian, the head of the Nazi operation. Alicia begins dating the criminal while simultaneously falling in love with Devlin. Alicia gets stuck marrying Sebastian, causing tension in her relationship with Devlin, but she discovers that the villain is protective of a key to the wine cellar and that something peculiar persists with certain wine bottles. A large party at Sebastian’s home allows Devlin and Alicia to orchestrate the invading of that cellar where they discover bottles containing uranium ore. Discovering his wife is a spy, Sebastian and his wicked mother devise a plot to kill Alicia. The story and the actors do a great job of setting the viewer on edge as we panic that Sebastian will discover Devlin is a spy/the two were lovers. At the same time, the chemistry is so great between Grant and Bergman that we want nothing but for them to be together. A great scene between the too caught the negative attention of censors. When first arriving in Rio de Janiero, Alicia and Devlin have dinner in a hotel room. They spend a good deal of time kissing and talking, moving from the balcony inside. At the time, the Production Code allowed a kiss to persist only so long and this sequence defied that. Hitchcock was able to insist on the scene’s necessity, however, because dialogue was inserted between the nuzzling and developed the story. Another Hitchcock victory straight from the Hayes office. Hitchcock also managed to keep in the suggestion that Alicia was quite the experienced woman, in bed. She mentions adding Sebastian to her list of playmates before the two are married, hurting Devlin in the process. In 1979 when Hitchcock was recognized by the American Film Institute, Ingrid Bergman presented him with the prop key used in this movie, which she had kept as a souvenir. The MacGuffin: What is in the wine bottles? Where’s Hitch? The director sips champaign at the party at Claude Rains’ mansion.